Just a few weeks ago, I attended the funeral of the father of four family friends from my childhood. Our families grew up together, spent much time at each other’s houses, or playing sports, or watching sports, or going to camp together or school or work together. And as I sat in the funeral chapel on this terribly sad day for all of us, with another mutual family friend, whose own father had just passed away just months before—the last time we had all gathered together in that chapel—I looked around at who was in the room. I noticed many familiar faces—in fact, I knew many people in that room, some almost as long as I knew the people suffering the most. What does this have to do with Alfred Hitchcock and Vertigo, you might ask? Well, what occurred to me, was that the people who were in that room—who came to stand with these wonderful beautiful people in their time of greatest need, to honor one of the kindest, gentlest, most loving souls who ever lived—were all the redwoods of their lives. All the old friends, from childhood, from the neighborhood, from growing up together, from camp. These were the redwoods—the ones who didn’t check their calendars to see if they could squeeze in “attendance at a funeral,” the ones who didn’t think twice about whether they were going—redwoods just show up when support is really needed. “Redwoods take no notice,” Madeleine said. They take no notice of inconvenience to themselves, they don’t care about two hours of traffic on the Southern State Parkway to get to the cemetery. They do what needs to be done for the people they care about. Quietly, with dignity, with little fanfare. It’s not about the fanfare—it’s is who they are, and more importantly, who they are in relationship to the one in need of support. 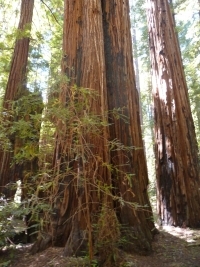 Redwoods seem to symbolize the quality of upeksha, or equanimity, one of the four brahmaviharas in Hindu and Buddhist traditions. When one cultivates that quality of equanimity, one can bend with the winds, but not break. One can weather storms, no matter how severe, and can come through them—changed, perhaps, but certainly not destroyed. Equanimity allows us to survive those events we think we cannot bear. The metaphor often used is that equanimity helps us learn to ride the waves rather than being swept away. This is not to say that the other trees in our lives—the flimsier, less reliable and less sturdy pines and birches and weeping willows—don’t have their places. And we appreciate them for the individual beauty and charms and gifts they each can deliver. But in times of crisis—when facing real life or death questions, those existential questions of Being—the great redwoods can be there for us in a way that pine tree cannot. And similar to Buber’s belief that one cannot possibly engage in an I-Thou relationship with every single person one meets—that some people by necessity wind up as “Its”—one cannot always be a redwood to all people. But on that terrible day a few weeks ago, for those people I love, how beautiful a sight I Imagine it must have been to look out and see themselves surrounded by redwoods.